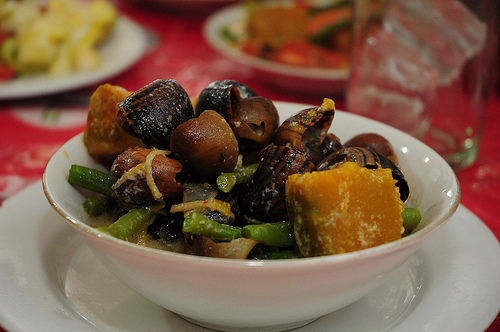 Nothing says comfort like the flavors and aromas of a home-cooked Pinoy meal. Admittedly, we love the fanciful culinary art of other world cuisines. But still there is nothing in the world like our Pinoy food. It is true that one can savor the tastes of the Philippines in more chi-chi establishments like Bistro Filipino, Abe or Sentro. But to really understand Pinoy cuisine you have eat in a Filipino home. If that is not an option, trying hitting the streets and asking the locals where they go for lunch. My first visit to Caruz Eatery was almost a decade ago. At that time, I was doing store checks with a company salesman when lunch rolled around. For lunch, he brought me to this small carinderia. Caruz was the literal embodiment of a hole-in-the-wall. While the place itself was simple and unadorned, the food left an indelible impression on me. It was the best Filipino food I had outside my mother’s kitchen. I promised to return. Fast forward to last month. Erik Lacson and I decided that we want to highlight the best of Pinoy food. While discussing which of myriad of Filipino restaurants we could photograph, I recalled a small carinderia in Pasig I had visited years ago. I couldn’t remember its name but I recalled loving the food. After little searching, we rediscovered Caruz Eatery. Although the once-humble turo-turo has become larger and a section is now airconditioned, the food is still as I remembered it–simple, delicious and comforting for both the stomach and the soul. To take a peek at the delectable food of Caruz Eatery, please click here. While viewing the slide show, please click on the photograph itself for more information. Many thanks to Nellie and Choy Caruz. Your food and hospitality are much appreciated. I can't find the slide show :( But, I worked in that area in the 80s and is the Caruz up near Valle Verde, or towards Shaw Blvd already? I remember a carinderia that was great. It was standing against the wall of the lube bays of the Caltex at the corner of Shaw and Hillcrest. Wonder if still there. There's another famous eatery in the area, near the infamous motels naman. What was it called again? Served sizzling sisig with tons of onions and egg. I still prefer Trellis though but I know some people would head up to this eatery for lunch break from UP or Ateneo. Hello solraya. I checked the link. It seems to be working. :) Caruz is actually closer to Shaw, right across from Victoria Court. that picture of the dish from caruz looks yummy! we might just try it one of these days when we're feeling a bit adventurous. we have been to Aysee and my hubby loves the sisig there. i however feel its a little too loaded with onions. Thank you for the yummy reminder! I have forgotten about this place! I used to eat here a lot (though on some occasions, we just ask them to deliver the food when it's time to eat with my closet carinderia-loving friends from L'Oreal. : )). Will check it out again. Hello Pam. You're welcome. :) I myself cannot resist a good pinoy meal--not matter where it's cooked.